The flat, rough-looking pink matter covering the rock on the left side of the picture is a form of crustose coralline aglae. 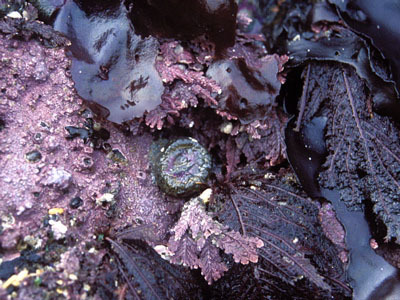 Another type of coralline algae is seen above and below the anemone. It is pink, as well, but has a branching, segmented structure. To the right of the coralline algaes are several dark, lacy branches of a red algae, commonly referred to as sea fern.